Sweet cicely (Myrrhis odorata) is a hardy perennial herb that blooms in spring (usually in May here). Supposedly it prefers moist, well-drained soil that is full of humus and thrives in partial shade, but I have found that here it will grow anywhere and everywhere and can be quite invasive. 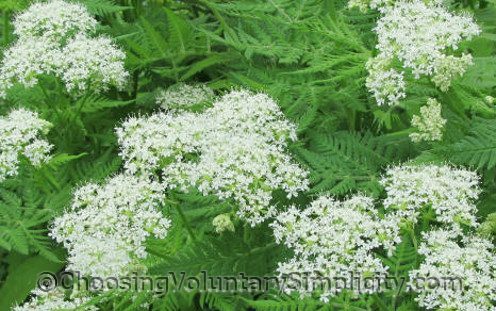 After a couple of years sweet cicely can reach a height of three feet, and individual plants grow closely together to form a dense clump of fern-like leaves and small white flowers. After the flowers fade, groups of deeply-ridged seed pods will start to form… changing from a light green to a deep brown as the seeds ripen. At this point in self defense I get in there with scissors and cut off all the stalks of seed pods… otherwise the seeds will fall onto the soil and produce an astonishing number of new plants the following spring. Some people believe that the seeds need to freeze and thaw in order to germinate. I have found that seeds collected during warm weather and stored in the freezer will show a surprisingly high germination rate if they are planted the following spring. Sweet cicely plants can also be divided but will wilt to the ground and look absolutely hopeless no matter how carefully you make the division. They do recover quickly however and in a few days will look as perky as ever. Sweet cicely is often described as being difficult to propagate because its seeds are finicky about germinating. That certainly hasn’t proven to be true here… it’s a beautiful plant but it naturally self-sows so easily. I’m constantly fighting a battle to keep the plants I have under control. Sweet cicely is also a culinary herb. The flavor is often described as being a cross between anise and celery, and my herb reference books suggest using the seeds in candies or as a substitute for caraway… steaming and then pureeing the roots… and adding the leaves to salads. Hard Boiled Eggs… in the Oven? I understand that parts of “Sweet Cicely” can be used as a sweetener [ perhaps useful for diabetics?] How does one sweeten rhubarb and cooking apples with it and which parts? 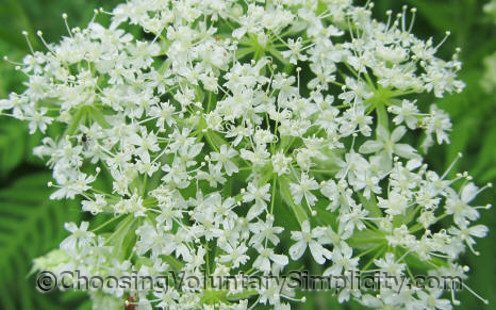 Theresa, I have not tried this personally and this isn’t listed in any of my (older) books, but I have recently read that the young flowers or leaves of sweet cicely can be used as a sugar substitute when cooking tart fruits like rhubarb. Supposedly a handful or so of the leaves can add enough sweetness so about half the usual sugar is no longer needed. The leaves can be dried or frozen for later use. I love my sweet cicely, but I do have to admit that it is very invasive. I started with just a few plants but unless I keep it under control it would spread to take over my whole garden and maybe my whole yard too. It is still one of my favorite plants though because of its beauty and its wonderful licorice aroma. 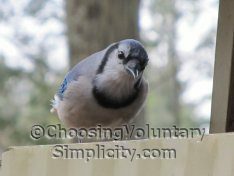 Your photographs in this article are especially beautiful. 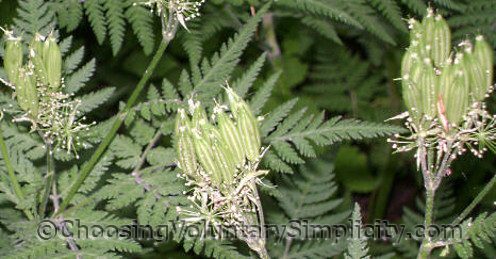 Is there a proper time for dividing Sweet Cicely? Thanks. Sweet Cicely can be divided in either spring or fall. My gardening books recommend dividing Sweet Cicely at least every four to five years… simply cut the taproot into sections, making sure that each section has at least one eye. Then replant each section in its permanent location. I don’t think Sweet Cicely is classified as invasive, but it certainly has been invasive here. If you don’t want lots of plants, make sure you cut off the seed pods so the seeds don’t drop and sprout. It’s a beautiful plant, but if it likes where it’s growing, it can become a real nuisance!